The very creamy alfredo sauce is made completely from scratch with half and half, freshly grated Parmesan cheese, basil and crushed red pepper! This pasta is very easy to make, and all the ingredients and the vegetables complement one another nicely. Dovetailing Tip: Use the extra pound of grilled chicken you prepared on day 1. In a large pan, on high heat, sautee garlic and sun-dried tomatoes (drained from oil) in 2 tablespoons of oil (reserved from the sun-dried tomatoes jar - see note above) for 1 minute until garlic is fragrant. Add the rest of vegetables (asparagus, each sprig cut into 3 slices, and thinly sliced bell peppers), sprinkle with a small amount of salt, and cook on medium heat for 2-3 minutes until they soften just a little (you still want them to have a bit of crunch). Bring a large pan with water to boil and cook pasta according to package instructions. Reserve some cooked pasta water. Drain and rinse the pasta with cold water (to stop cooking). Add half and half to the skillet with vegetables and bring to a gentle boil. Then, add grated Parmesan cheese, mix it with half and half as it is boiling for only 30 seconds until it melts, then reduce heat immediately. Simmer and cook, constantly stirring, until all cheese melts and creamy sauce forms. If the sauce is too thick - don't worry - you'll be adding some cooked pasta water soon. Add 1 tablespoon of basil, and at least 1/4 teaspoon of red pepper flakes. Stir to combine. Add cooked pasta to the skillet with the creamy sauce, and stir to combine. season the pasta with salt and more red pepper flakes, to taste, if needed. Let it simmer for a couple of minutes for flavors to combine. 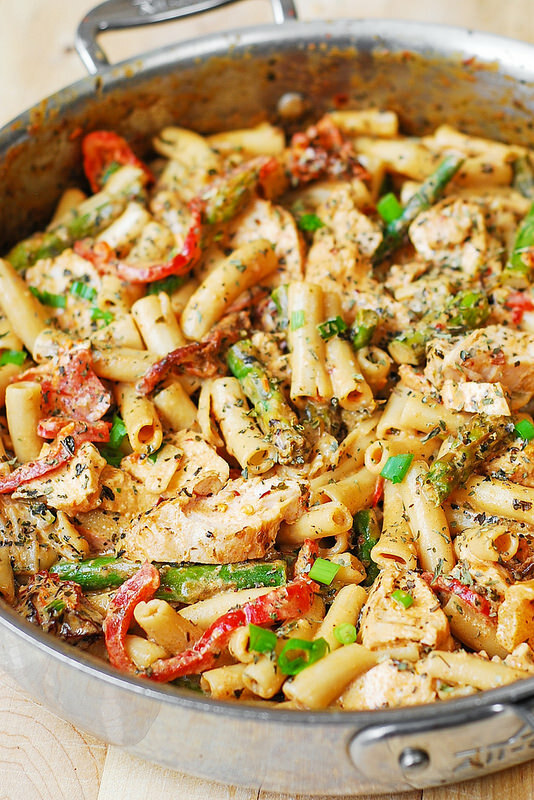 Top with grilled chicken breasts, sliced into strips - or stir them into pasta. Make sure to salt the dish just enough to bring out of the flavors of basil and sun-dried tomatoes.